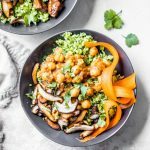 This broccoli rice stir fry is a 30 minute meal that uses broccoli rice as a base and is topped with marinated beef or chickpeas–your choice! Start by whisking the sauce ingredients together in a bowl (the chickpea and beef sauce ingredients are the same minus the kind of broth you use); set aside. Make the broccoli rice by cutting the broccoli–stem included–into 1″ pieces and placing them into your food processor. Pulse for 15-20 seconds until the broccoli resembles rice; set aside. Cook mushrooms and garlic in a skillet with a bit of oil until they’re slightly golden on each sides. The more golden-brown they are in color, the crispier they’ll be. Place the broccoli rice in a large skillet and cook for 2-3 minutes until it’s warm. You don’t want to cook it too long or it will get soggy. For the beef: place beef in a plastic bag and add the flour, then shake the bag so that the beef is coated in flour. Heat oil in a skillet over medium heat, and cook the beef until it’s done to your liking. Remove skillet from the heat, then pour in the sauce, slowly stirring. You want the sauce to thicken a bit, so if it doesn’t thicken right away, turn the heat back on to medium-low and it will. For the chickpeas: place chickpeas in a skillet over medium heat and heat for 2-3 minutes, stirring occasionally. Slowly pour in the sauce ingredients and stir. You want the sauce to thicken, but be careful that it doesn’t thicken TOO much. If it does, quickly remove it from the heat. To assemble: pour broccoli rice into a bowl, then top it with the mushrooms, sliced carrots, and beef or chickpeas. Drizzle a little extra soy sauce over top and enjoy!